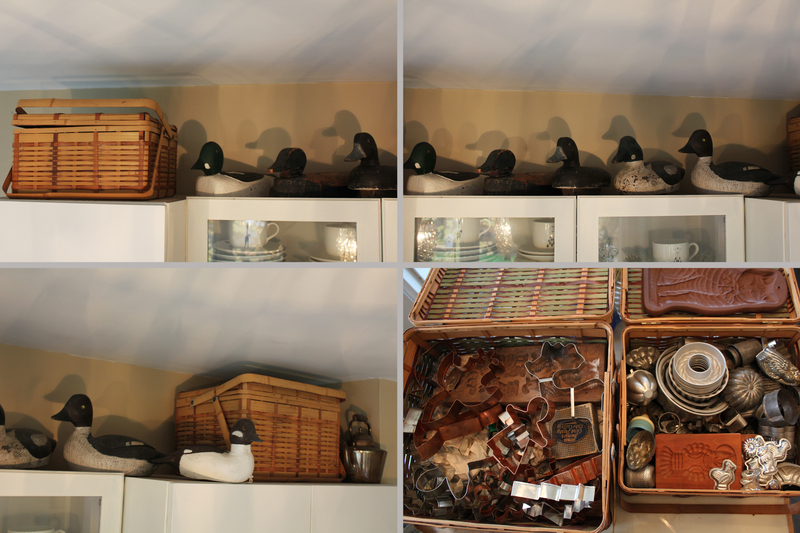 On top of my kitchen cupboards are two old baskets at either end of my duck decoy collection. These ducks count the amount of times I’ve been in Quebec, because I buy one each time I visit, and the baskets hold my collection of vintage and antique cookie cutters, presses and other cookie tools. Every time I get these baskets down and open them, they remind me of lovely, special times in my life. Ah, here’s the one I’m looking for. 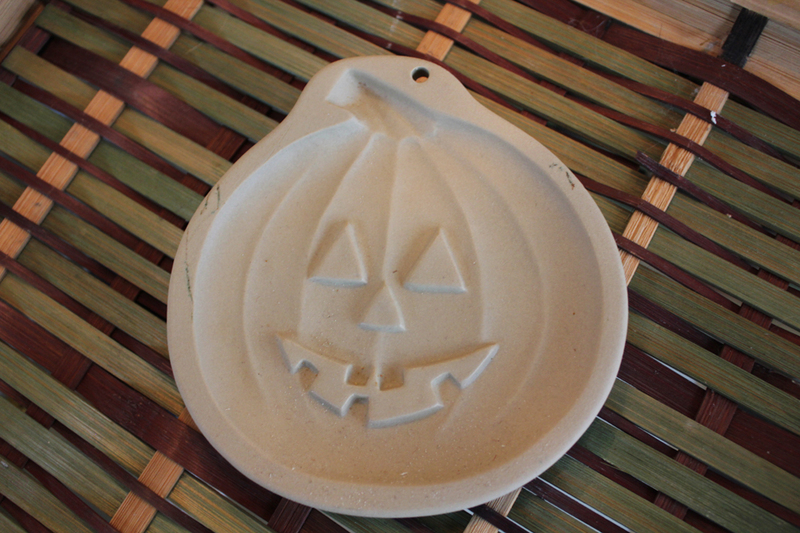 It’s a ceramic mold made by The Brown Bag Cookie Company. I’ve had some of these molds for millions of years, but they are still available. 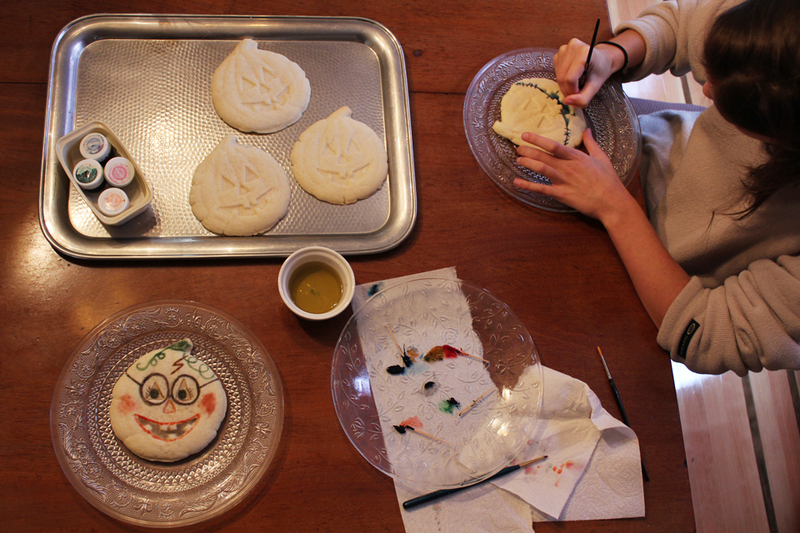 Painting cookies is really easy, but you need specific food colouring. The kind you need is the kind that colours icing. It comes in little pots and is creamy thick so it doesn’t dilute the icing. 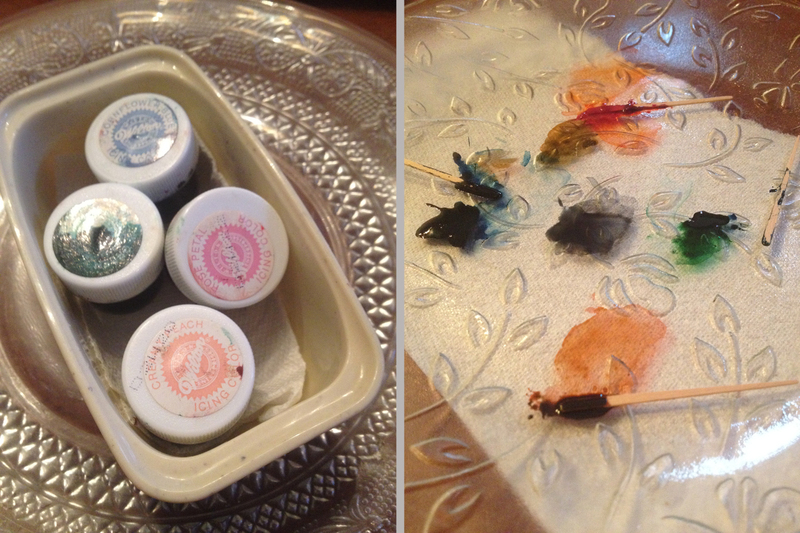 You should use a toothpick to put some on a plate because the stuff will stain your fingers like nothing else…lol. I bought a selection of four in a kit. They are green, blue, rose and orange, and, with them, I can easily mix browns, purples and a black, so I find that’s all I need. I asked C to join in and we sat down and started painting. 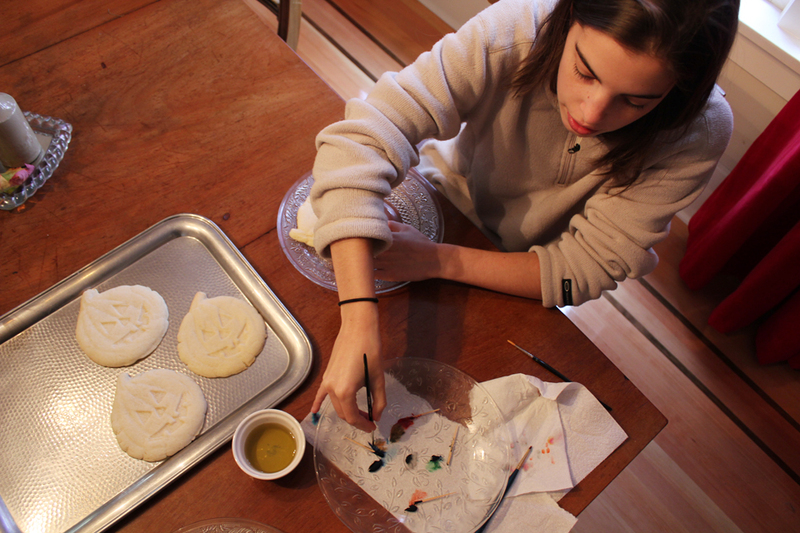 There have been times when we’ve had several children painting their own cookie and times when we’ve made over 20 for us and our neighbours and taken them to the cabin for a party, but big batch or small batch, everyone has the best time painting cookies. It’s really satisfying. And here they are, all painted and waiting for our special trick-or-treaters to show up. Norma’s drawing challenge: Pink Horses!!! What a great idea to bring back a decoy each time you visit Quebec. Makes for a very special collection. You guys did a great job on the cookies! That is such a great idea. Of course, it helps if the painters are as talented as you and C! 🙂 Thank you Michelle. 🙂 Next cookie painting will be for Christmas I guess…gulp! I love both your duck collection and cookie cutters. What precious memories! Happy Halloween…enjoy the cookies. Happy Halloween to you too Rachel. I love attaching special meaning to my collections. Do you do that too? What a cool and meaningful collection. It must give you pleasure each time you pass by. The cookies are just adorable! What a great little artist! 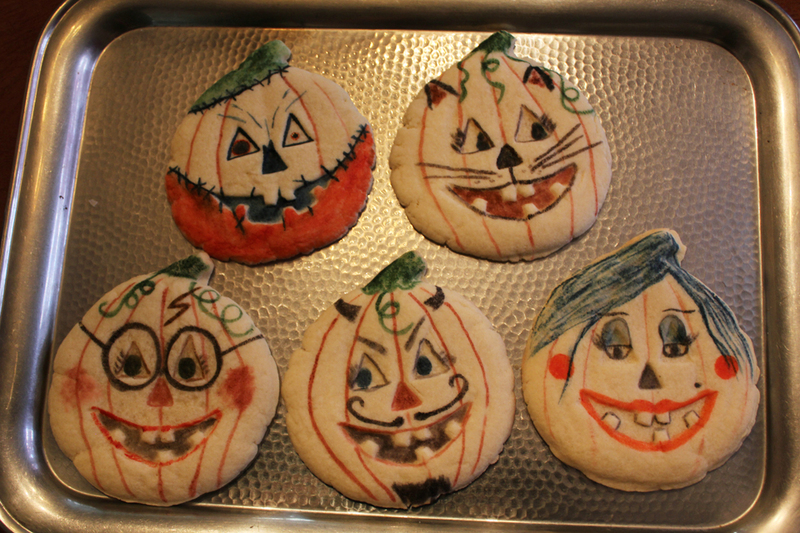 O my gosh, those are the cutest pumpkin cookies I have ever seen! I think so too! You know what? I just remembered I used those molds in the past to make cards molding tissue paper and white glue into them. I wonder if I still have one around. Probably a Christmas one. I’ll try to dig one out of storage. 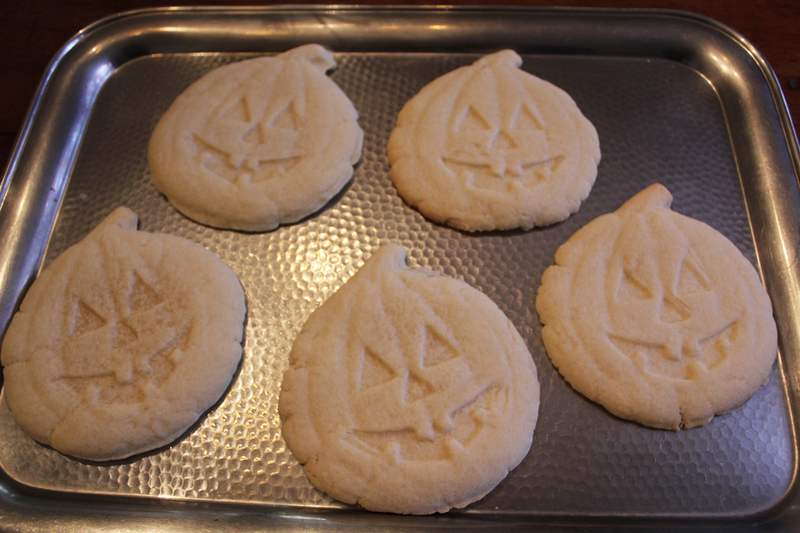 Kicking myself for not making Halloween sugar cookies yesterday! These are wonderful. Thanks Nancy. I have a wreath and a Santa for Christmas , so was just thinking you have Thanksgiving coming up don’t you? (Ours is much earlier) And you can make some then. 🙂 I’d love to see if you make them. I hope you do try painting. It’s really simple and, actually, the simplest designs are the best anyway. 🙂 My grandmother, then my aunt used to make gorgeous Christmas cookies in the traditional Czech way, and I guess that now that they are both gone, it might just be up to me. 🙂 This might be the year of the Czech cookies…lol.